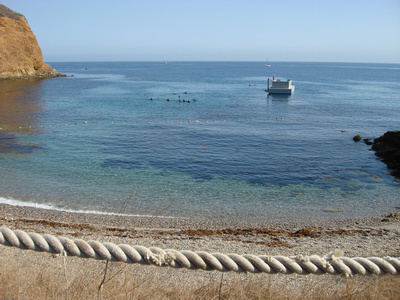 Doctor's Cove at Emerald Bay (slide show) offers some of the top diving at Catalina Island. It is the most popular dive spot at Emerald Bay for beginners and continuing education because it has easy entry/exit points in a protected cove with calm conditions. While conditions can vary due to weather, this spot is more protected from waves, current and surge which can reduce visibility and increase swimming effort. From the Dive Locker at Camp Emerald Bay, it's a short walk down a wooden stair case to Doctor's Cove. At the base of the Cove there is a bench to sit down and relax or make any adjustments to gear. The entry is an easy pebbled and sandy beach. Underwater you will probably find sweeping kelp beds, large and small bat rays, leopard sharks, Garibaldi fish and moray eels right inside the cove. Lobster, rock fish and if you get lucky, you might see a giant black sea bass. Come back at night and find octopus, abalone and sleeping fish. There is also a small wreck at the mouth of the cove. Local boat diving is offered during the summer and sometimes during the fall and spring when conditions are good. For continuing education and more dives, local boat diving offers tremendous opportunities to explore and experience the diversity of nearby reefs.